During World War I, the U.S. railroads became grid-locked with war related traffic to such a degree that they literally ground to a halt. The federal government then stepped in and ‘nationalized’ or took-over the entire system—for the duration of the war. Among the things they did was inventory everything that the railroads owned. This included inventorying every rail car, every wrench, every nut, every bolt and an inventory of all the land—and how it was obtained. This land inventory became known as the Valuation Maps—or ‘Val Maps’ for short. 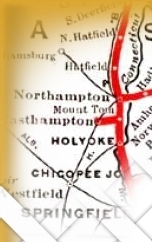 Not only did the Val Maps lay out the route of the railroad through a community, the maps gave locations and name of every structure near the railroad track. the number of tracks, location and length of sidings, bridges, culverts, etc. As you can imagine these maps today are invaluable for a host of reasons. Not the least of which were how the railroad acquired the land and the worthiness of the deeds or chain of title. Also, since the inventory was a 'snap-shot' of what was the high water mark of the railroad buildout, these maps also show all the likely places where contamination or 'brownfields' will be found. Obviously the chain of title and brownfield assessments are the two major reasons why these maps are in such demand today. The current owning railroad’s real estate department has complete sets. County Hall of Records usually have those in their district. Railroad historical societies usually have most if not all of them. Dealers in ‘railroadania’ or railroad paper documents. The Florence Val Map here shows the location of 3 coal sheds, 2 railroad sidings or spur tracks going into the property of Norwood Engineering Company (Norwood is now the location of Ross Bros. Antiques and other small locally owned businesses). It also shows a scale for weighing horse drawn wagons, a yard complex that was 4 tracks wide and both a freight house and a passenger station. 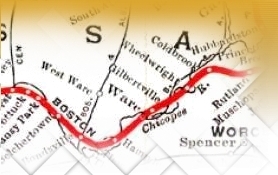 NEGS has access to all the archival valuation maps of former steam railroad corridors in the northeast and has created an extensive database for the state of New Hampshire in 2004 as to what they own along over 250 miles of former railroad corridor and where the likely brownfields might be located along the right of way.